WE are a dynamic onslaught of Seattle’s creative voices presenting Fleenor’s works for Blindfolded Ensemble, and other exploratory scores. For this show, WE will present different aspects of the blindfolded work as well as perform the 2011 conduction work SILT, originally commission by the Seattle Jazz Composers Ensemble and UMAMI Performance. 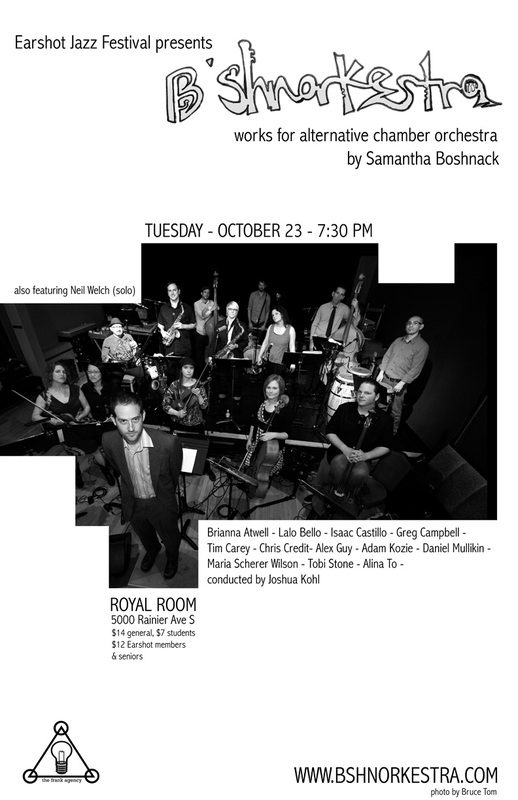 The outstanding trumpeter and emerging composer Samantha Boshnack presents her riveting work with a large ensemble. Opening: rising regional sax star, Neil Welch, a driving performer in the tradition of Coltrane and other adventurers, performs solo. 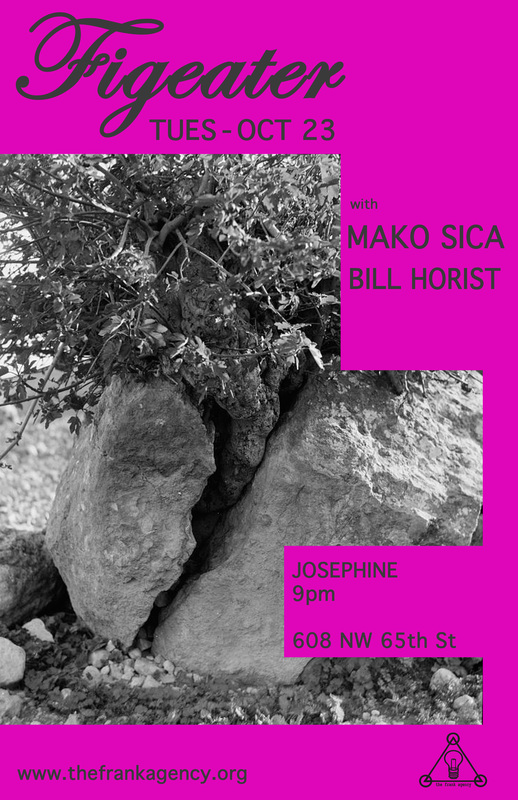 Mako Sica, featuring former members of Rope – dark, atmospheric, ECM Flavored doom surf with notes of Eighties industrial bands like Psychic TV and Einstruzende Neubauten. Ethnographic chanting and twin Caspar Broetzman style guitars pealing over lush, pulsing drums. Bill Horist brings his original recipe prepared guitar improvisation. Opening this performance is the Royal Room Collective Music Ensemble, a conduction group led by Wayne Horvitz, featuring many of the same musicians as the Voodoo Orchestra: drums Bobby Previte, saxophones Greg Sinibaldi, Neil Welch, Kate Olson, bass clarinet Beth Fleenor, trumpets Al Keith, Samantha Boshnack, Steve O’Brien, trombones Naomi Siege, Jacob Herring, French horn Tom Varner, string bass Geoff Harper and piano Ryan Burns. The Royal Room Collective operates around a unique system of instant arranging fueled by musical symbols that Horvitz newly created specifically for this music. Frankly Mondays October features Sugarpants, performing high energy music for soprano sax, upright bass and drums, alongside Beth Fleenor’s new Workshop Ensemble (WE). WE are a dynamic onslaught of Seattle’s creative voices presenting Fleenor’s works for Blindfolded Ensemble, and other exploratory scores. 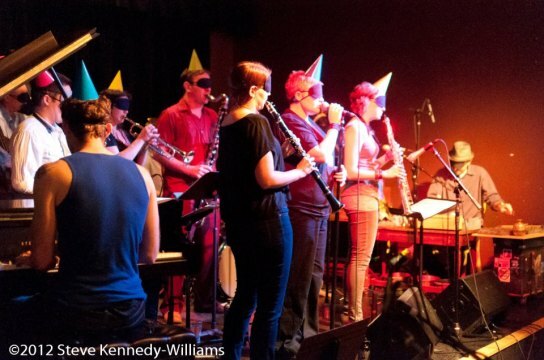 For this show, WE will present different aspects of the blindfolded work as well as perform the 2011 conduction work SILT, originally commission by the Seattle Jazz Composers Ensemble and UMAMI Performance.